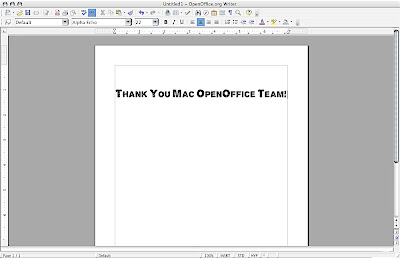 The Mac OpenOffice team released the second snapshot of the Aqua (X11 free) version of OpenOffice today. While there is more to be done before it is ready for people to use in a reliable and easy fashion, it is really making headway. The big thing is that you can print from OpenOffice now. That’s important. The print dialog isn’t Mac’s so that still needs work, but gosh it’ll be there soon enough. At this point it is still too early to review the new OpenOffice, but it looks like it is on its way to becoming the same great free office suite on Mac that it is on every other platform. Mac users, get ready to throw your copy MS Office in the trash. You can open and save Microsoft Word, Excel, and PowerPoint documents, or use safer open formats.